Most stores realize that this price matching thing could quickly get out of hand. So they have set up some pretty detailed guidelines that you would be well to check before attempting a mass assault. (You can click on the store images above for each of their specific guidelines.) Perhaps the most important point to keep in mind is that the item usually has to be identical. Same product (including brand and size) and sold in same increments. For example, at Walmart you could not price match ALDI toilet paper with Charmin, or ALDI 3-pack green bell peppers with Walmart’s single priced bell peppers. But if pineapples are 99¢ each at ALDI, hop over to your local Walmart for a perfect price match! This is a bit harder to do since ALDI carries a lot of their own private labels. However, check out their circular each week and you will often find name brands in the Special Buys. For example, with spring coming, Al needed weed killer and planned to buy it on sale at Home Depot. As we were perusing the ALDI ad online, we noticed Spectracide weed killer on sale for a dollar less than Home Depot’s sale price. Maybe it was only $1, but after the 10% off by using a discounted Home Depot gift card, we saved over 25% with minimal effort. Not only does ALDI usually beat everyone else’s food prices out of the water, but produce is one of their easiest products to price match. Why? You don’t have to worry about brands. Carrots are carrots and avocados are avocados, you just need to make sure they’re being sold in equivalent quantities. In a previous post entitled 5 Steps to Find a Grocery Store That Saves You Money, we mentioned how distance can and should be a determining factor for which store will save you the most money. ALDI’s distance is right on the borderline for us. It’s about 20 minutes from home and the only store in its area that we patronage. So if we need to stock up, we make the drive and the savings are definitely worth the gas. However, if we happen to see just one or two items on sale that we want, we saunter down to our local Walmart (which happens to be down the street from my work) and take advantage of their convenient price match. What’s better than a price match? A price match where you get more than originally advertised. And what do I mean by that? Let’s take the pineapples as an example. You already know that our ALDI sells pineapples on special for 99¢. 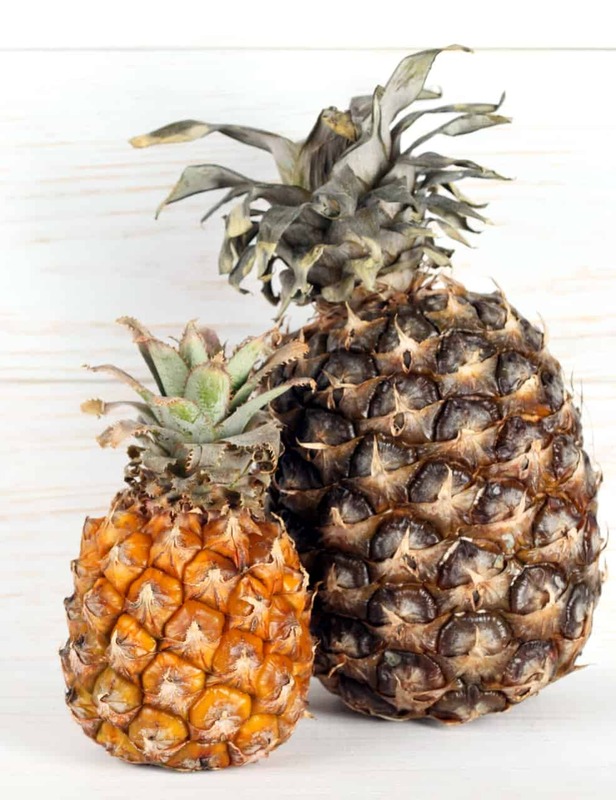 However, their pineapples tend to be a little on the stunted side. In fact, some are outright TINY! But no worries. Price match at Walmart and I get a hefty, full-grown pineapple that is about double the size, can feed my family for a week, and is 99¢! Congratulations, you just doubled your savings! So don’t waste any more time being content to shop anywhere else. And if you don’t have an ALDI near you, start campaigning for one in your area. Not only will you be saving the crumbs in your budget, but soon you will see those crumbs stack up into significant savings going back into your wallet! Ahhh! I we do not have an ALDI in the Fresno CA area but we do have discount stores like Grocery Outlet and Wilco etc. I would absolutely LOVE to get my food budget down!!! I was all in…..until I read price matching weed killer….lol. You can easily create DIY weed killer in your kitchen, provided you have a pump sprayer to distribute it…..
That is interesting! Please share the DIY recipe, sounds like a great tip.